Excerpt from Vanessa’s Book, 101 Costly HR Mistakes… and How to Fix Them! During an HR Audit, “Simon,” the Facilities Coordinator, requested to speak with me. He told me a story I will never forget. So, how would you feel?… Most of us, exactly like Simon! As the above scenario outlines, when employees do not receive feedback and/or evaluations it is difficult, if not impossible, for the employee to understand company expectations. The employee may feel they are doing their jobs correctly and may believe they are exceeding expectations. In essence, they could be failing. I ask you this, what type of atmosphere will be created if employees are confused as to their expectations. It could devastating to productivity. Also, lack of administering performance evaluations could open the employer up to expensive litigation, i.e., wrongful discharge! Employers should take the time to conduct performance evaluation. It is recommended that new hires be evaluated every 30 days, 60 days and 90 days. Regular employees should be evaluated bi-annually at the least. Promoted employees should be evaluated the same as a new hire. Providing evaluations take the guesswork out of employee performance and expectations. It also can protect the organization from risk. 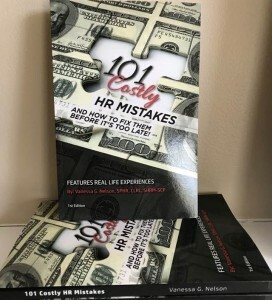 To read this story and similar stories, click here to purchase 101 Costly HR Mistakes…and How to Fix Them!